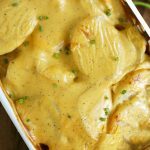 These Cheesy Scalloped Potatoes are just like the ones that Mom made growing up. Full of cheesy, melty goodness and perfect for Easter brunch or Sunday supper. Use a mandoline or knife to thinly slice the potatoes into coins. These should not be paper thin, but not too thick either. Place the sliced potatoes into a large stockpot and add enough water to cover the potatoes. Salt the water generously (about 1 tsp). Boil the potatoes over medium-high heat until just soft. They should be fork tender, but not mushy or falling apart. When the potatoes are almost finished boiling, start preparing the sauce. Add the butter and flour to a large saucepan over medium heat. Continue cooking the flour and butter until a thick paste (or roux) forms. This will begin to bubble, but do not let it burn. Slowly add in the milk while stirring constantly. Once all of the milk is added, cube the processed cheese and add it to the saucepan. Continue stirring constantly until the cheese is melted and the sauce begins to thicken. Adjust your heat if necessary, but do not let the mixture burn on the bottom. Stir in the salt and pepper. Taste and add more as needed. Drain the boiled potatoes. Add a layer of potatoes (half) to a large baking dish. Top the potatoes with half of the cheese mixture. Add in the remaining potatoes and top with the remaining cheese. Bake for 20-25 minutes, until the cheese is bubbly and golden brown. Cover with foil if it is browning too quickly. Top with green onions or fresh thyme if desired.